Blanch the cleaned and trimmed asparagus. Drain and arrange in a pan. Melt butter in a saucepan over medium heat. Add the flour stirring constantly until it cooks and bubbles a bit, but do not let it brown — about 2 minutes. Next, add the garlic, stir for another minute. Add the hot goat milk, continuing to stir as the sauce thickens. Bring it to a boil. Add salt and pepper to taste, lower the heat, and cook, stirring for 2 to 3 minutes more. Pour over asparagus and top with thinly sliced goat cheese. Bake in center of oven until bubbling and beginning to turn golden. Then turn oven to high broil and finish it off under the broiler until browned. Vivianne cooked well. It was May, and the morning air on the farm was still cold enough to require a hat when I went out to set up the milking parlor. Through the window into the creamery I could see Manu already packing cheese that had drained in large nylon sacks before. A rich lactic aroma filled the bulk tank room as I made sure the chiller was on before I began milking. The heat and moisture from the creamery atmosphere contrasted with the cool air that hung in the milking parlor; the goats huddled together up on the platform as they did every day. After all, this happened every day, all year long. But asparagus was ephemeral. Lunch came at noon. Vivianne had been to market and came back with white asparagus, thick as a quarter and the color of ivory. 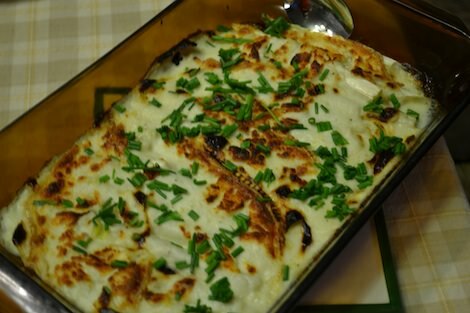 She made a béchamel sauce using milk from that morning, with the addition of young garlic and plenty of pepper, and laid the halved stalks in the pan in the most efficient way. More sauce covered the asparagus--it was white on white, to be followed by yet more. Vivianne sliced several thick cuts from a new pavé of fresh goat cheese and laid them over the top. This went in the oven to bake for 30 minutes; near the end she turned up the broiler. What emerged was no longer only white, but browned and golden. The béchamel bubbled, the asparagus was tender, and the aroma was like that of the creamery next door: richly lactic, and assertively reminiscent of goats. A toss of minced chives finished the dish on the plate, along with a slice of dark whole grain toast. This is a spring treat, and a distinct taste from the Ardennes Mountains of Belgium. If you cannot find goat milk, this recipe would work fine with regular milk and goat cheese.